Is the iPhone's iPod feature perfect? If you follow this blog, you’re aware that the iTunes Store offers the Free on iTunes section where you can browse the week’s (or, in some cases, month’s) free music and video offerings. You may also be aware that, thanks to the iPhone/iPod touch 3.0 software, you can now download the Store’s video content to these portable devices. Wouldn’t it be great if you could combine these two features—easily locate free content and download it to your iPhone or iPod touch? Regrettably, the mobile version of the iTunes Store doesn’t allow this. There’s no section in the handheld Store that displays free content (and no, entering the link I posted above in Mobile Safari earns a reaction no more helpful than “Huh! ?” from the iTunes app). But there’s a way. That way is to fire up Safari on your iPhone or iPod touch and make haste for the Free iTunes Downloads website. 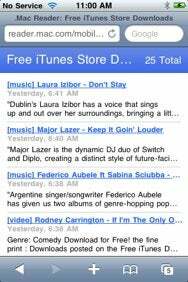 This is a site that publishes links to the iTunes Store’s free content. Tap one of these links on your iPhone or iPod touch and the iTunes app opens and takes you to the screen where you can download the associated song or video. But let’s make it even easier. When you get to Free iTunes Downloads with your iPhone or iPod touch, tap the Subscribe to our RSS/Atom feed link. This gives you a handy, pared-down page with these same links. Tap a link and you see a description of the item—a plot summary for a TV show or artist’s bio for a song—followed by a Download For Free! link that, when tapped, opens the iTunes app and takes you to that item's page for downloading. Tap the Plus button at the bottom of the Safari screen and you can save this RSS feed as a bookmark. I’ve taken the extra step of tapping Add to Home Screen so I can easily maneuver to this feed when I want to quickly scan the Store’s free offerings. I expect this will be a useful thing to have when I’m stranded in an airport waiting area and looking for fresh (and free) content.